BoA:Audio closes the book on Season 7 as we welcome legendary alien abductee Travis Walton for an in-depth discussion on his historic UFO encounter and the subsequent firestorm which continues to swirl around the case to this very day. At long last, we conclude our marathon seventh season with an iconic and ironic player in the epic history of paranormal studies: Travis Walton. In the penultimate edition of BoA:Audio's 7th season, we welcome longtime friend of the program Bill Birnes for a discussion on his new book Dr. Feelgood. It is a breathtaking edition of the program which will have you looking at American history in a whole new light as we learn about 'Dr. Feelgood' Max Jacobson with Bill Birnes. After seven long years, BoA:Audio finally examines the infamous Amelia Earhart mystery with our guest Carol Linn Dow, author of the book The Lost Flight of Amelia Earhart. It's a long overdue episode which delves into one of the world's most enduring and intriguing mysteries as we search for Amelia Earhart with Carol Linn Dow. BoA:Audio continues our work building a bridge between the paranormal and scientific communities as we welcome Dr. Tyler Kokjohn, who is both a professor of microbiology at the Arizona College of Osteopathic Medicine as well as a keen observer of the esoteric and the esoteric research community. Altogether, it is an epic edition of the program which spans three hours and covers wealth of topics in both the paranormal and scientific worlds with our guest Dr. Tyler Kokjohn. BoA:Audio takes a journey to the underground as we welcome author Wm. Michael Mott for a discussion on his book Caverns, Cauldrons, and Concealed Creatures, which looks at the possibility that there is an entire ecosystem, including nefarious entities, existing beneath the Earth's surface. Please help support BoA : Audio by making a donation. Want to donate via snail mail? BoA:Audio welcomes author Thomas Fusco for a discussion on his groundbreaking book Behind the Cosmic Veil. Over the course of this lengthy conversation, we'll dissect Thomas' theory on the nature of the universe and learn how it may explain the way paranormal phenomena manifest themselves. A fast paced and loose edition of the program which takes you to the very periphery of the paranormal and peers into the abyss with our guest Wm. Michael Mott. It's time, once again, for BoA:Audio's annual paranormal pause celebrating the emergence of Spring as we welcome a cavalcade of esoteric stars for our 2013 Baseball Special. Joining us for this year's festivites are 2012 prediction contest winner Paul Kimball, Greg Bishop, Adam Gorightly, Jason Offutt, Richard Dolan, and winner of the 2012 listener prediction contest, 'shotz90s' from theusofe.com. Collectively, we'll look forward to a whole new baseball season, look back at the year that was, and share our predictions for how 2013 will unfold. Along the way, we'll also journey down a number of sideroads unrelated to either baseball or the paranormal, but still quite a bit of fun. BoA:Audio examines a bizarre and chilling phenomenon which has recently emerged from the world of the paranormal as we welcome David Weatherly, author of The Black Eyed Children. It is a comprehensive and compelling conversation which aims to pull the curtain back on the furtive and frightening Black Eyed Kids phenomenon with accomplished esoteric researcher David Weatherly. BoA:Audio returns to the land Down Under as we welcome Andrew Nicholson from the fantastic blog Weird Australia. It's a veritable walkabout amidst the paranormal main streets and backroads of Australia with our tour guide to the esoteric land Down Under, Andrew Nicholson. BoA:Audio is joined by author Ardy Sixkiller Clarke, who shares her revelatory and unique research into American Indian experiences with UFOs and ETs, as chronicled in her book Encounters with Star People. It is a truly breathtaking edition of the program which offers a wealth of previously untold tales of UFO and ET encounters by witnesses who have a unique respect for the phenomenon with our guest, Ardy Sixkiller Clarke. This is an absolute barnburner edition of the program where we explore one of the most controversial and remarkable theories in all of the paranormal world, the terrestrial reptoid hypothesis, with the man who has spent the last twenty years on the trail of the reptilians: John Rhodes. BoA:Audio ventures into the realm of the skeptics as we welcome Sharon Hill, creator and editor of Doubtful News, for a discussion on skepticism, the paranormal, and the theoretical intellectual landscape that may be able to harbor both worlds. It is a spirited but respectful discussion about the skeptical perspective and how it is both strikingly similar as well as vastly different from paranormal research with an honest advocate for solving paranormal mysteries, Sharon Hill. BoA:Audio wraps up our marathon of returning guests with an epic three hour conversation with the prolific and loquacious Paul Kimball discussing his book The Other Side of Truth. It's a conversation which spans space and time, looks at life and death, and examines aliens and elves with longtime friend of the program, paranormal pundit extraordinaire, Paul Kimball. Concluding our traditional annual programs, we welcome renowned cryptozoologist Adam Davies back to BoA:Audio for a debriefing on his 2012 expeditions to Sumatra and America. Akin to a reunion with an old friend at a local pub, Adam Davies returns to BoA:Audio for a rollicking conversation recounting his adventures of 2012 and covering a wealth of cryptozoological topics. BoA:Audio bids farewell to 2012 with our annual Year in Review special featuring longtime friend of the program Greg Bishop. Nearly live and shoehorned in between our respective day jobs, we consider a wealth of big (and small) stories from 2012. We recount some of the highlights, lowlights, and odd ball moments of the past twelve months with the always entertaining Greg Bishop. It's time, once again, for our celebration of the season as BoA:Audio proudly presents our 8th Annual Holiday Special featuring the legendary Stanton Friedman. Another jam-packed edition of the program where we welcome back one of the cornerstones of BoA:Audio and wish you all a very Happy Holidays with the iconic Stanton Friedman. BoA:Audio explores the theoretical world of time travel with longtime friends of the program Marie Jones and Larry Flaxman, co-authors of This Book is from the Future. A highly conversational edition of the program which throws the talking points out the window in favor of a fast paced series of 'what if' time travel musings with the always entertaining Paraexplorers, Marie Jones and Larry Flaxman. In light of last year's wildly popular Bruce Rux Thanksgiving episode, we continue the tradition with the 2012 installment of the now-dubbed 'Ruxgiving' edition of BoA:Audio. 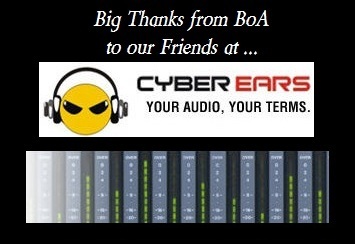 BoA:Audio gives thanks to the listeners with our old friend Bruce Rux in our annual Ruxgiving feast. Prolific Fortean researcher and great friend of the program, Nick Redfern makes his long overdue return to BoA:Audio for a marathon conversation covering one of his most recent books, The Pyramids and the Pentagon, as well as a previous book, Final Events, which may have profound meaning for the UFO enigma. Altogether it is a brisk conversation that is also jam packed with amazing stories, intriguing anecdotes, and thoughtful analysis about a myriad of paranormal mysteries with a true trailblazer in the field of esoteric studies, Nick Redfern. In honor of Halloween, BoA:Audio explores an obscure aspect of the spirit world with Chris Balzano and Tim Weisberg, authors of the book Haunted Objects. Over the course of the conversation, we'll examine the thorny questions like what constitutes a haunted objects v. a ghost's prop as well as how and why objects may get haunted. We'll hear a myriad of fantastic stories, including haunted tools, a seemingly possessed piece of demonic posterboard, and, yes, Robert the Doll. We'll also delve into tangential areas like psychometry and Ouija Boards. Plus, the final half hour features a lively jam session discussing and deconstructing the field of ghost hunting. BoA:Audio examines the connection between Hollywood, UFOs, and the government with doctoral candidate Robbie Graham, creator of the critically acclaimed and massively popular Silver Screen Saucers. Over the course of our conversation, we'll discuss how Hollywood shapes the public perception and expectations of the UFO phenomenon and ETs, how pervasive government itervention is in UFO entertainment, and how the DoD & CIA work with filmmakers to advance differing agendas. Plus, we'll talk about the rise in 'UFO films' in the last decade and ponder what that might mean about the population's mindset on the phenomenon and whether its part of a larger campaign to prepare us for contact. BoA:Audio ventures into uncharted waters as we welcome Kendall Carver, founder of International Cruise Victims, for a discussion on the troubling trend of disappearances and felonious crimes committed on cruise ships as well as how they are subsequently covered up by the cruise ship industry. Altogether it is a deeply disconcerting edition of the program which will likely leave BoA:Audio listeners flummoxed and outraged at the underdiscussed crime wave on the high seas that has been uncovered by Kendall Carver's International Cruise Victims organization. BoA:Audio examines the nebulous area between cryptids and the paranormal as we welcome Neil Arnold, author of the book Monster! - The A-Z of Zooform Phenomena. Over the course of the conversation, we'll discuss the zooform theory, potential candidates for zooform phenomena, trends in zooform reporting, creatures like Bigfoot, the Loch Ness Monster, Mothman, and the Highgate Vampire as well as UFOs, MIBs, and alien abductions. We'll also talk about the Big Cat phenomenon in England as well as the overal 'tulpafication' of many paranormal entities. Esoterica's 'crackpot historian' Adam Gorightly makes his long-awaited return to BoA:Audio for a jam session covering his new book, Happy Trails to High Weirdness: A Conspiracy Theorist's Tour Guide, and a plethora of other side topics and tangents. Over the course of this freewheeling conversation, we discuss conspiracy conventions, suspicions of being monitored by the 'powers that be,' the 'zine scene era, Jeff Turner and his Tuesday Weld Illuminati theories, Charles Manson, the 2008 Bigfoot Body Hoax, the JFK assassination, the co-dependency of UFOs, and other assorted hijinks. BoA:Audio pauses our usual paranormal pursuits for some extended coverage of the Aurora, Colorado theater shooting. Joining us on the program are a pair of longtime BoA:Audio friends: Loren Coleman, author of The Copycat Effect: How the Media and Popular Culture Trigger the Mayhem in Tomorrow's Headlines as well as Bruce Rux, a lifelong resident of Aurora who happened to be attending a Dark Knight Rises midnight premiere at the infamous Century 16 Cinema, but in a different theater, on that fateful evening. BoA:Audio returns to the realm of the cryptids with our guest Lyle Blackburn, author of The Beast of Boggy Creek. In this lengthy conversation, we discuss Texarkana's Fouke Monster, made famous in the film Legend of Boggy Creek. Lyle will detail the evolution of the Fouke Monster phenomenon, the famous sighting which started a media frenzy, the filming and fallout of Beast of Boggy Creek, why the geography of the area makes it an ideal place for a large cryptid to lurk, the controversial claims of a Bigfoot skeleton found in the area, and much, much more. BoA:Audio celebrates the 4th of July by welcoming legendary parapolitical researcher Kenn Thomas for a jam session that covers the world of conspiracy theory and beyond. We discuss the field of parapolitics, Kenn's doppelganger, the JFK assassination, conspiracy theories surrounding Osama Bin Laden's death, Sirhan Sirhan's legal defense, the explosive and expansive growth of personal technology, the faltering of space exploration, Timothy Leary, legends of Forteana, the military industrial complex, and even what happens when you die. BoA:Audio returns to the realm of UFOs with our guest, filmmaker Sean Kotz, who discusses the 1987 UFO flap in Wytheville, Virginia, which will be chronicled in his forthcoming documentary Strange Country: A Different Kind of UFO Documentary. Sean will detail the story of reporter Danny Gordon, who found himself in the center of the UFO maelstrom after he made what appeared to be a seemingly innocuous report on a UFO sighting in the the Wytheville area. We'll learn about how Gordon was overwhelmed with sighting reports from local citizens, the strange characters who emerged in the area as the UFO flap grew, and the troubling events which beset Gordon's life as he dug deeper into the UFO mystery. BoA:Audio celebrates our 200th episode with the long-awaited return of William Zabel to the program. Incommunicado since his original appearance on the program back in 2009, William Zabel will provide us an update on his whereabouts over the last three years as well as an in-depth look at the Columbine Conspiracy. We'll rip the lid off of this bizarre story and gain even further insights into what William believes happened in Littleton, Colorado in April of 1999. In this nearly 2.5 hour-long conversation, we'll discuss how and why the conspiracy began as well as how the events of the school shooting really unfolded and suspicious details from witness testimonies which suggest the 'official' version of events is false. Along the way, we'll learn about the Columbine connections to evangelical Christians, HAARP, Sharon Stone, Dana Plato, 'death education' programs, and many more odd aspects of this story. BoA:Audio examines one of the great controversies and mysteries of World War II as we welcome Gerrard Williams, co-author of Grey Wolf: The Escape of Adolf Hitler. In this expansive conversation, we'll go in-depth on the Hitler death hoax, including why the 'mainstream' version of Hitler's death is fundamentally flawed, how Martin Bormann laid the groundwork for the escape years before the war ended, Hitler's likely journey to Argentina and his post-war life there, children fathered by Hitler, and his ultimate fate years after the war ended. Beyond that, we'll discuss some of the obscure and tangential elements of the war, including the extensive plunder of European art by the Nazis, how their poor organizational skills facilitated a victory of the Allies, and how there were even machinations by high-ranking Nazis to twist the war into a unified battle against the Russians. BoA:Audio welcomes our old friend Jason Offutt back to the program for a lengthy conversation covering the many odd and creepy stories found at his blog, From the Shadows. We'll be hearing tales of wicked priests, harlequin entities, gnome-like creatures, black eyed kids and people, a Fae Girl, time travelers, a haunted shopping mall, Gravity Hill, a man who dated an 'alien,' and much, much more. Adding to the menagerie of cryptids covered on the program, BoA:Audio explores the iconic and infamous Loch Ness Monster with our guest Roland Watson, author of The Water Horses of Loch Ness, speaking to us direct from Edinburgh, Scotland. In this marathon conversation, we'll discuss Nessie from a myriad of angles, including the evolution of Nessie in mainstream popularity, the many ways monster hunters have tried to prove its existence, the controversial "Surgeon's Photo" which allegedly shows the creature, the various theories behind what Nessie might be, how to best "hunt" the monster, and how the local at Loch Ness feel about mystery after all these years. Plus, of course, tons and tons more. BoA:Audio begins another journey into the world of the esoteric, the unknown, the paranormal, and the parapolitical as we launch Season 7 of the program with our traditional premiere guest: the legendary Jim Marrs. Among the topics discussed in this freewheeling conversation are ancient aliens, UFOs, the nefarious New World Order agenda, technology and surveillance run amok, weather manipulation, population control, Ron Paul and the 2012 election, and how dire the geopolitical landscape looks for those of us hoping to see a better tomorrow. Alongside the doom and gloom are plenty of laughs, sober reflections, and nostalgic looks back at how the world has changed since we sat down in August of 2005 to begin this program.